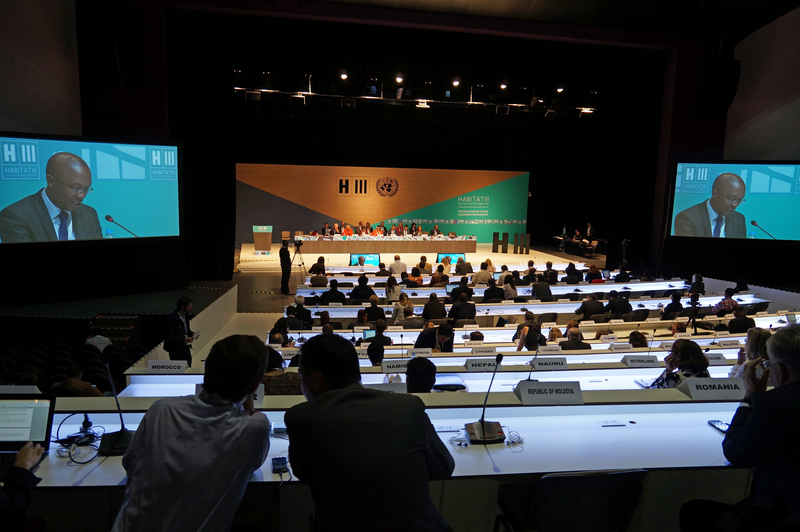 On Sunday the 16th October 2016, on the eve of the Third UN Conference on Housing and Sustainable Urban Development (Habitat III), over 600 representatives of local and regional governments gathered in Quito for the World Assembly of Local and Regional Governments. Over 45 local and regional leaders addressed the World Assembly, celebrating the inclusion of many of their recommendations in the text of the Quito Declaration, and committing to work to achieve the New Urban Agenda in their cities and territories. In his remarks to the Assembly, UN Secretary General, Ban Ki Moon, recalled the origins of UCLG and UNACLA in Habitat II and their role working to implement global agendas at the local level, and to exchange knowledge between cities. He predicted that Habitat III will strengthen this partnership, saying that he encouraged local and regional leaders to continue to raise their voices on the global stage. The World Assembly marked the culmination of a strong presence of local and regional governments throughout the conference. 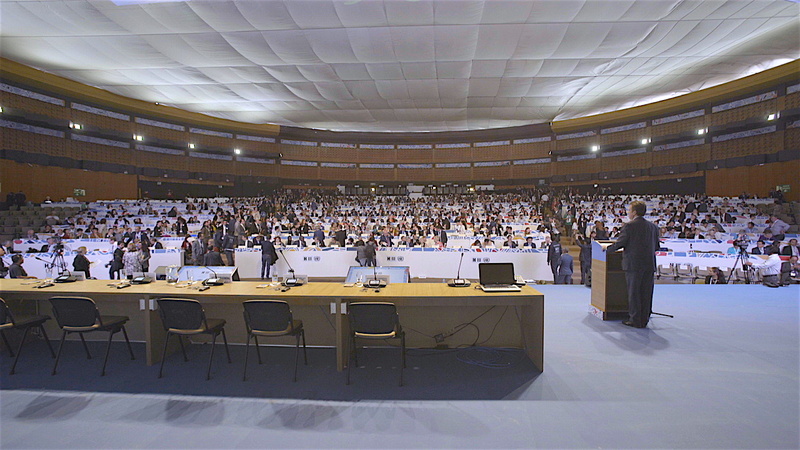 On Monday the 17th of October local and regional leaders from around the world attended the opening plenary of the Habitat III Conference, represented by Mauricio Rodas, Mayor of Quito (Ecuador), who recalled the important role played by local governments in sustainable urban development, and the importance of linking the New Urban Agenda to the SDGs. Monday also included the presentation of the report of UCLG’s Global Observatory on Local Democracy and Decentralization, GOLD IV: "Co-creating the Urban Future" by elected local leaders, academics and experts. Since 2008, the GOLD reports have grown into a landmark publication and a reference worldwide for the study of the most pressing issues affecting and driving the decision of local governments around the world. GOLD IV addresses the challenges and opportunities that local and regional governments face in the implementation of the new global development agendas, particularly the SDGs, the Paris Agreement on Climate Change and the New Urban Agenda. The Fourth edition of the report takes an innovative constituency-based approach, looking at the unique challenges and opportunities faced by metropolitan areas, intermediary cities and territories in each chapter. Following the success of the World Assembly of Local and Regional Governments, the UN Secretary General Ban Ki-moon met with mayors to thank them for their commitment to the battle for sustainable development. 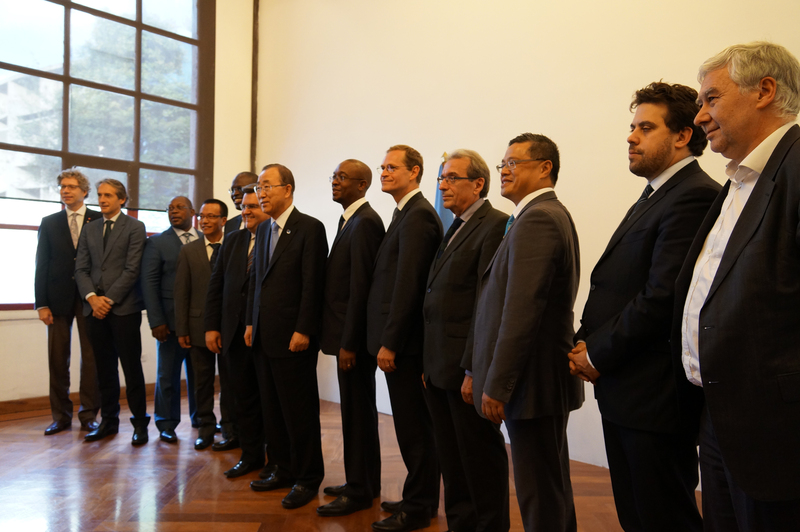 Local leaders congratulated the UN Secretary General for his support throughout his mandate. Later in the day, UCLG participated in the Special Session on Urban Governance in the official Habitat III programme and co-organized side-events on ‘the multi-dimensional reality of migration in cities’ with ICMPD and UN-Habitat, and on ‘Collaborative space linking science, visualizations, and design on a range of thematics’ with ICSU. The UCLG committees on Local Finance and Culture organized sessions on Financing the New Urban Agenda and Culture and Urban Governance, respectively. Newly elected UCLG Co-President and Mayor of Barcelona, Ada Colau, participated in the First High Level Round Table on Leaving No-one Behind. She shared Barcelona’s strategy for tackling social and geographical inequality and emphasized that cities must have, not just a voice, but also decision-making powers at national and international level. 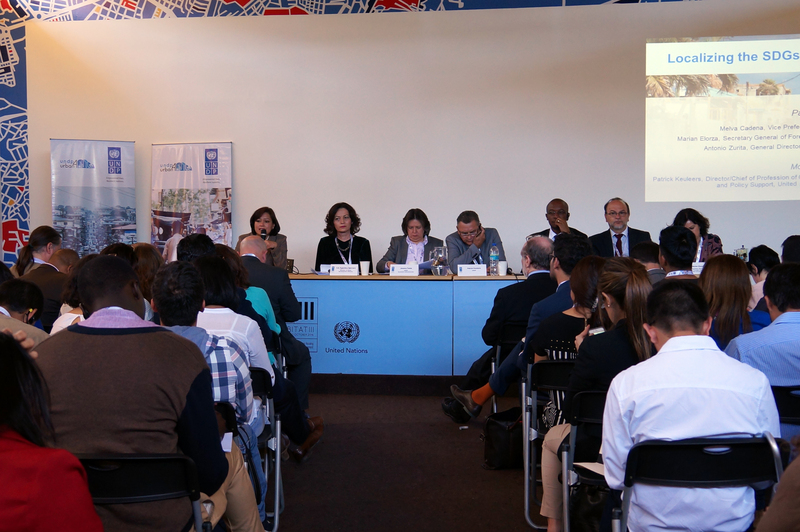 On Tuesday the 18th of October, there was a dialogue on Urban Governance, Capacity Building and Institutional Development to follow-up on the Policy Unit 4. 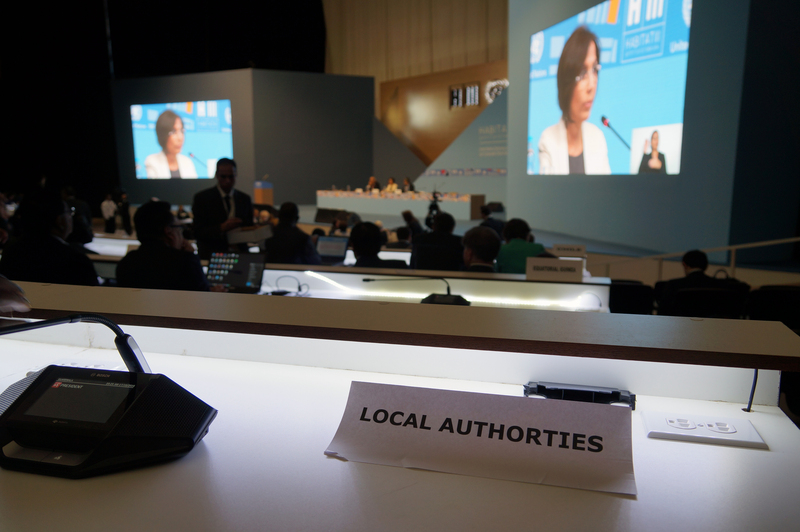 UCLG, the Global Taskforce and the LSE have coordinated the inputs of experts in urban governance for the policy paper of Policy Unit Four for Habitat III. The panelists highlighted the key recommendations outlined by the paper, including the creation of strong multi-level governance frameworks, strengthening of decentralisation processes, promotion of integrated national urban and territorial policies, reinforcing metropolitan governance, promoting a new culture of participation and equity, strengthening capacity-building for urban governance, and enabling digital era governance. On the same day, the Local and Regional Government Lounge hosted a session on the Right to the City, organized by CISDP, and the Local Finance Committee co-organized a session on ‘Financing the New Urban Agenda: Multi-level Metropolitan Finance for 21st Century Cities’ with the Brookings Institution. Patrick Braouezec, President of Plaine Commune and Co-President of the UCLG Committee on Social Inclusion, Participatory Democracy and Human Rights, participated in the Networking event on Municipal Finances, organized by the Committee on Local Finances for Development. He recalled the crucial role of local and regional governments regarding inhabitants’ welfare and rights, and called for a “new redistribution of wealth, in order for regional and local governments to be able to meet inhabitants’ needs. He also stated that “local governments need to recall international and national governments’ responsibilities in guaranteeing inhabitants’ rights by leading with example and involving them in policy-making and advocacy. The Urban Dialogue on the Right to the City addressed the main dimensions of the Right to the City through the debates held in two panels. 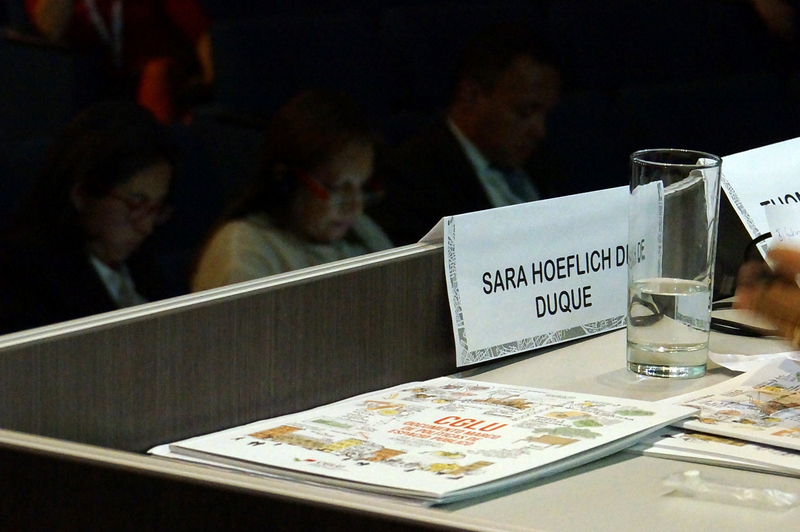 The first was made up of members of the Global Platform for the Right to the City (Augusto Barrera, Alison Brown, Ana Falu, Nelson Saule), as well as Rosario Robles, Secretary of Urban Development of Mexico and Right to City champion throughout the Habitat III process. The second panel included participants with diverse backgrounds, representing local governments for the right to the city (Patrick Braouezec), the Latin-America Development Bank (José Carrera), and the Canada governments, as well as an architect with a strong focus on social housing. Many strong messages were transmitted to a crowded audience: the need to strengthen public capacities in order to make the right to the city real; the challenge of continuing the expansion and articulation of the global movement for the Right to the City in order to build a critical mass; the construction of a narrative to frame the implementation of the New Urban Agenda within a perspective for the right to the city, and the utmost importance for a gender approach to be included on it (since the way women live the city is still different from men’s). Other dimensions addressed were urban informal workers, who make a huge contribution to local and global economies while they suffer rights’ deprivation, and the need for strong social housing policies to guarantee affordable housing for everyone as a Human Right. Finally, Patrick Braouezec identified the construction of cooperative, solidarity-based metropolitan areas as the main challenge for the urban future to come. On Wednesday the 19th of October, UCLG co-organized an event called “The Shift” on housing as a human right with co-organized by the Office of the High Commissioner for Human Rights and the UN Special Rapporteur on the Right to Housing to bring together a diverse range of stakeholders to discuss the idea of launching a global campaign to put human rights back into housing, and to secure the right to housing on international, regional and domestic agendas. In a full to bursting room, urban inhabitants, social organizations, NGOs and foundations, human rights defenders, representatives of local governments and states were asked by UN Rapporteur on the Right to Housing, Leilani Fraha, to tackle the main challenges to change paradigm for the right to the city and then they thought collectively on the goals and main lines of action of a Global Campaign for the right to housing, in order to gather energies and articulate different levels from global to local, to change the overarching paradigm of housing as a commodity. Wednesday also included a surprise ceremony in the Global Taskforce Lounge to celebrate the role of the women who played a leading role in the Habitat III negotiation process. There was also space to discuss the localization of the 2030 agenda at Habitat III. The Global Taskforce, UNDP-Art and UN Habitat presented the platform: www.localizingtheSDGs.com recently launched to become a knowledge exchange platform to localize the SDGs at local level. The SDG localization process highlights how the empowerment of local stakeholders is essential to make sustainable development more responsive and therefore relevant to local needs, aspirations and lives. Parks Tau, on behalf of the GTF, explained the importance of creating knowledge and awareness at local level to concretize implementation; the need to invest in advocacy to ensure that the role of partners in implementation is appreciated and the necessity of monitoring the implementation process. There were also a number of sessions on public space throughout the week with the participation of cities as Barcelona and Bogota, including the presentation of the UCLG Public Space Policy Framework. 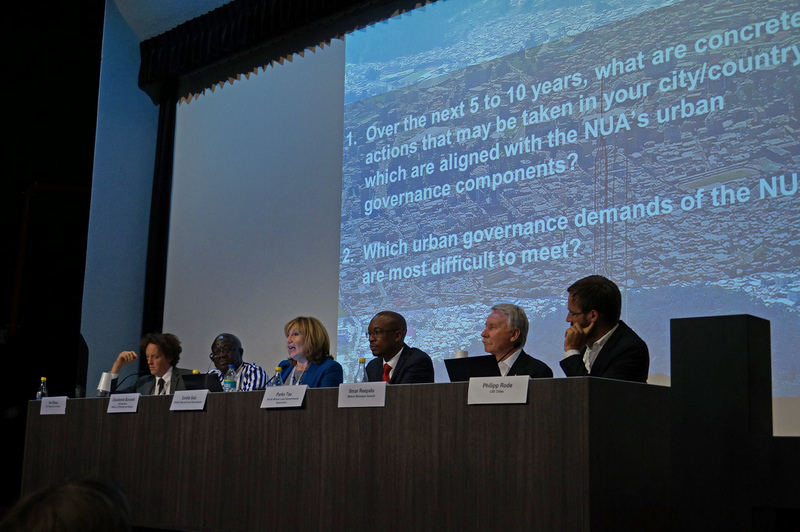 The highlight from the third day of the Habitat III Conference was the High Level Round Table: Implementing the New Urban Agenda at All Levels and with All Actors, with the participation of newly-elected UCLG President and President of the South African Association of Local Governments (SALGA) Parks Tau.